We love our T-shirts and want to thank you for making them for us! We will order again in the future. Thanks Again! Just want to personally tell you how pleased we are with the Tshirts we just received from your company. We absolutly love the design and the softness. Just wanted to let you know how delighted we all are here with our T-shirts!! They are wonderful, high quality shirts and I know we will be making more orders in the future!! I just had to drop a line to tell you how much I love the coats I recently received. They are beautiful and the workmanship is perfect. Thank you so much for doing a great job with my order! The teachers loved their shirts and I was very pleased with the shipping, you made my job really easy!! The quality of the shirts are great too! Thanks and I am sure we will order again. It's not very often that people take the time to give a praise report, and I find them much needed in our world today. I just wanted to take a moment to tell you that BetterLife has a wonderful team. Each person I've came into contact with has been extremely helpful and polite, and I greatly appreciate their enthusiasm. We received our order today and I couldn't be more pleased with the work. I look forward to doing business with BetterLife again. I am writing this to thank you and your Customer Service staff for the excellent service I received. I called to inform you of my issue and I'm happy to say that the person on the other end of the phone was terrific. She listened, informed me of what she was going to do, what I needed to do and completely followed through so that we were NOT left waiting! I have ordered from you several times and am happy to say that we have always been 100% satisfied with the product. Thanks so much for great products but also for the excellent customer service! I just wanted to take time to let you know how much the staff at my school LOVED our recent shirt order. Many of my students were jealous because I didn't include them in our order this year. I am certain if you have any more that my school will be excited about ordering them. It looked very sharp! My "A pet's love is forever" t-shirt arrived today and it is beautiful! It may be my favorite yet and I have several of your pet-themed t-shirts (all of which are great and I receive compliments when wearing them). By the way, the folks who answer your customer service calls are awesome - - truly some of the nicest people on the planet. I would like to take this time to congratulate you on outstanding service! I placed three separate orders over the past few months. When they arrived we were all very impressed by the quality and design of each shirt. They are very comfortable and every shirt was perfect! Congratulations again on the professionalism, quality and friendliness of your company and staff. I will definitely recommend your company and purchase more items as new designs become available. WOW! I received the shirts I ordered for our pharmacy this past Friday, and we LOVE them! They are high quality, wash well, and have already caught the attention of our customers. The only problem....I wish I had ordered more. :-) What a great way to celebrate National Pharmacy Month! Thank you again, we are so pleased, and will be repeat customers! Just wanted you to know that I received the shirts: Life is Great... Massage Makes It Better. They are terrific (I mean GREAT!)! I love the soft cotton and the design. Too often we get the negative news. I wanted to send some positive news and let you know I love them. I ordered two for another massage therapist, and she loves 'em, too. I placed an order for 43 shirts for most of our faculty. They arrived on Wed and we are so pleased with them!! They are adorable and on our teacher salaries, the price was certainly right! We already plan to get a different shirt next school year! Thanks! We have received our order for t-shirts and they are beautiful. Our staff is delighted with the shirts and look forward to wearing them. Your phone order staff was very helpful and courteous, and a follow-up order for 2 more shirts was handled very professionally. Delivery was as promised and our order was complete in every aspect. Thank you very much for your professional service in handling our t-shirt order. We will look forward to future business with your firm. I just wanted to let you know how thrilled everyone is with the shirts you made for us. We were a bit hesitant to order unseen off the internet and have been pleasantly surprised and pleased! 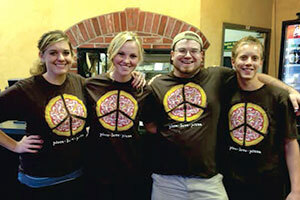 We just received our "bakeries make it better" t-shirts and LOVE them! 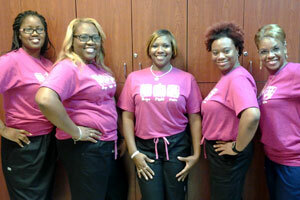 They look fantastic and we, of course, look fantastic wearing them at Suzanne's Bakery & Eatery in Athens, Alabama. I wish I had doubled my order and can't wait until you offer them again! We just received our 75 T-shirts for the New London Public Museum and we love them!!! (In fact, the librarians at the New London Public Library are very jealous!) I hope you will continue to offer these in the future, as we hope to need more next year! just a quick note to mention that we received our order of chiropractic t-shirts today. not only were there no problems, but my boss loves them so much he wants to order more immediately! we'll look forward to reordering as soon as the design is available again (we know you run designs cyclically). anyway, just wanted to say thank you for the great work and look forward to doing business with your company again soon! I have just finished handing out our staff t-shirts and the compliments are rolling in! They love them. When they are happy, I am happy, so many thanks to you and your team for making me look really good. No returns to be made, only additional orders! Just wanted to take a minute to let you know how THRILLED we are with our personalized sweatshirts. Dr. Cross ordered them as a "thank you" gift for our employees in appreciation of their great team work during Pet Dental Health Month (February). The sweatshirts are great quality and the embroidery is first rate! Thank you for your attention to detail! And thank you for reasonable product pricing, complimentary embroidery and shipping. We look forward to working with you again in the future! Too often we hasten to pass on complaints while reserving our commendations. I applaud Better Life for outstanding customer service! Our order was completed and received accurately and much sooner than anticipated. Thanks to you and your staff for your commitment and contribution to ensure that each of us has a better life! I just wanted to send a quick note to tell you how much I appreciate the courtesy of your company regarding an order I placed recently. Not only did I receive great customer service each time I called, I was also very pleased to receive my completely accurate order in the mail. I have placed t-shirt orders with other companies in the past and have frequently had my order come with the wrong sizes or the wrong colors. Your shipment was perfect-and it made me very happy! I also appreciate the letter that came with my order giving me information on who to contact if there was a mistake in my shipment. I am thankful that I did not have any issues, but I appreciate the clarity in who to contact if I did. I look forward to placing other orders with you in the future. The crew at Taranto's Pizzeria in Ohio. --Photo from Debbie T.
The staff at Franklion Vision Department in Alabama are "Packing a powerful punch against breast cancer" with their t-shirts. 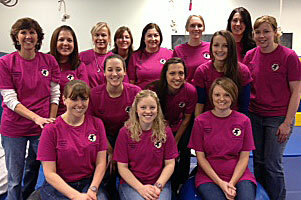 --Photo from LaTangula W.
The Pediatric Occupational and Speech Therapy staff at Exceptional Childrens Center love their new t-shirts. --Photo from Philip G.